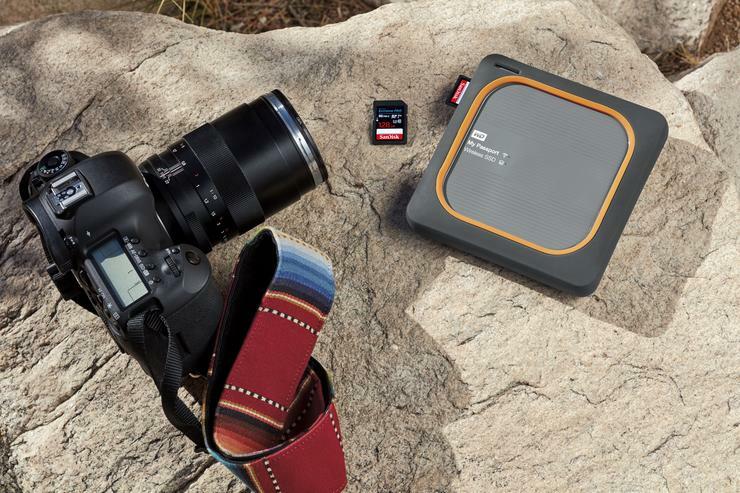 The Western Digital My Passport Wireless SSD also features a built-in SD card reader with up to 65 MB/s read speeds and a one-touch copy button that makes it easy to quickly pack up photos and videos from an SD card without a computer or additional software. The durable SSD is shock resistant to keep content safe from shock, vibrations or drops up to one meter, even when the drive in in operation. It also features all-day battery life, RAW image support and the ability to wirelessly stream 4K videos and view photos with the My Cloud mobile app. "As a travel photographer I’m often on the road, sometimes spending up to three weeks of the month away from home. From some of the most remote parts of Australia to Zimbabwe my camera gear and I are never in one place for too long. Having the right tools to do my job is key for me and access to a fast SSD in the field is crucial to my workflow. With this simple and easy to use device I can backup my photos through the simple touch of a button, review my photos in real-time via the My Cloud App and even charge all of my devices so they can outlast a long shoot day,” said, Lauren Bath, Australian travel photographer. Pricing starts at $429.00 for 250GB, $529.00 for 500GB, $849.99 for 1TB and $1,399.99 for 2TB. For more information, please visit the Western Digital website.